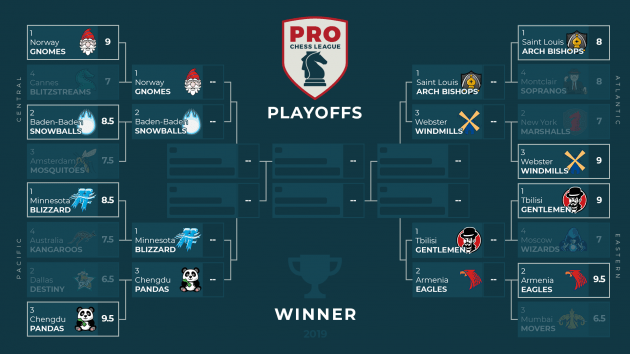 The first week of the 2019 PRO Chess League Playoffs saw eight teams progress to the quarterfinals, where they will each vie for a coveted spot in the live PRO Chess League Final in San Francisco this May. Their progression means that the PRO Chess League season came to an end for teams like the New York Marshalls, Dallas Destiny, and the Amsterdam Mosquitoes. Last week, the Montclair Sopranos snuck their way into the Playoffs with a heroic Battle Royale performance. However, if the Sopranos wanted to progress further, they would need to avenge their biggest loss of the season against the Saint Louis Arch Bishops. Unlike last year's Round of 16 match-up, the Saint Louis Arch Bishops had earned the tiebreak in regular season play, meaning that an 8-8 tie would see the 2017 PRO Chess League Champions move on. Without Lenderman or Sevian on the line-up, Saint Louis was able to build and early lead, as the tandem of GM Fabiano Caruana and GM Wesley So put pressure early on, both starting 2/2. So produced this grinding win against IM Raven Sturt to put the Arch Bishops in front. While Saint Louis continued to score points from their top two boards, Montclair's top two were resilient too. GM Gadir Guseinov and newly minted GM Nicolas Checa kept Montclair within reach, scoring a combined 3/4 to make a 5-3 halftime score, in favor of the regular season Atlantic Division Champions. Sturt and GM Michael Rohde tallied points from third and fourth board for the Sopranos, but a comfortable draw from So meant that the Sopranos were sent home packing after an 8-8 finish. While Arch Bishop fans may have wanted a chance to get revenge against the New York Marshalls, they will have to settle for a Quarterfinal against the Webster Windmills. Webster defeated the Marshalls, 9-7, as they denied New York a second comeback win. This sets up another intriguing Ray Robson-Wesley So showdown next week, as the two former college roommates will square off once again. With a trip to San Francisco on the line, this should be an extremely interesting match-up, especially given that Robson will also play Caruana and So in the US Chess Championships in the coming rounds. Though the matches in the Pacific may not have been as close as those earlier in the day, they certainly provided the most entertainment. The Dallas Destiny, a regular powerhouse team in the Pacific Division sought to do something it had never done before: beat the Chengdu Pandas. Having lost three times prior, Dallas would have to overcome the trend to have their shot at the live finals. The 9.5-6.5 loss sent the Dallas Destiny packing with a fourth consecutive loss against the Chengdu Pandas. Next week, the Pandas will take on the Minnesota Blizzard, who seemed fairly comfortable in their handling of the Australia Kangaroos. Was there any question? Both Tbilisi and Armenia flexed their muscles on Saturday, as both teams won convincingly to progress from the round of 16, setting up a much-anticipated quarterfinal between the two PRO Chess League giants. Entering the day, 75% of PRO Chess League Bracket Challenge submissions had picked Tbilisi to beat the Wizards, and 71% picked Armenia to eliminate the Movers. Even with Moscow's Vastrukhin finishing with a strong 3/4 from fourth board, Moscow conceded defeats against both Jobava and Pantsulaia. The final result stood 9-7, as Tbilisi moved on with Pantsulaia's perfect 4/4 score. Even with Mumbai closing the score late, fans will be treated to another edition of the PRO Chess League's newest rivalry between the Armenia Eagles and the Tbilisi Gentlemen. Baden-Baden and Norway both entered the Round of 16 as favorites in the Central Division, given that both teams had beaten their respective opponents in the regular season and had the draw odds tiebreaker. In the PRO Chess League Bracket Challenge, 75% of entries had Norway beating Cannes, and 61% picked Baden-Baden to progress. While Norway had their own star power on top board, Cannes' top tandem of GM Maxime Lagarde and GM Mattieu Cornette proved early that they could push the Gnomes around when they combined for 3.5/4 to open the match. Norway was able to pull away late, as Cannes was not able to capitalize on strong 3/4 performances from both Lagarde and Cornette. The match win means that Norway will take on Baden-Baden in the Quarterfinals. The match-up means that at least one team will make its debut in the live final in May, as both teams missed out in 2018. Commentary for this week of #prochess was provided by Robert Hess, Alexandra Botez, Anna Rudolf, and Danny Rensch. All shows and archives are available at twitch.tv/chess.